Brutalist Architecture Back to concrete! Grey, rough, inhuman: Brutalist architecture has a bad reputation. But that is currently changing. Fact is that the concrete monsters that arose from the 1950’s through the 1970’s can also be seen and described in other ways: as distinctive monumental sculptures – engrossing, immediate and bold. “Nothing about these buildings is fake. They display their material, whether concrete, brick or steel, purely and openly. Nothing has a hollow ring to it, like these insulation facades these days. Nothing is cladded, refined or smoothed away. 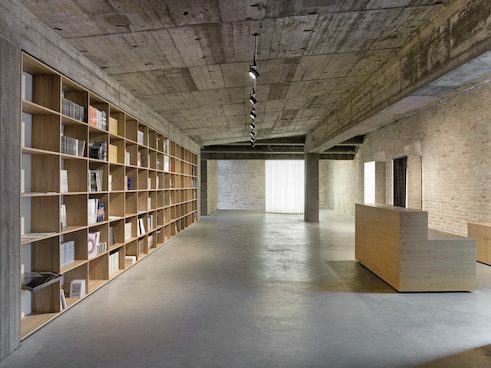 This architecture stands right in the rough-and-tumble of life,” says Oliver Elser, a fan of Brutalism and curator at the German Museum of Architecture (Deutsches Architekturmuseum) in Frankfurt am Main. St. Trinitatis in Leipzig | Academy of Architecture and Building | Photo: Uwe Pilz Originating in the United Kingdom and starting in the 1950’s, Brutalist buildings arose as a reaction to the endless sameness of glass fronts and smooth, grid-like facades of post-war architecture. 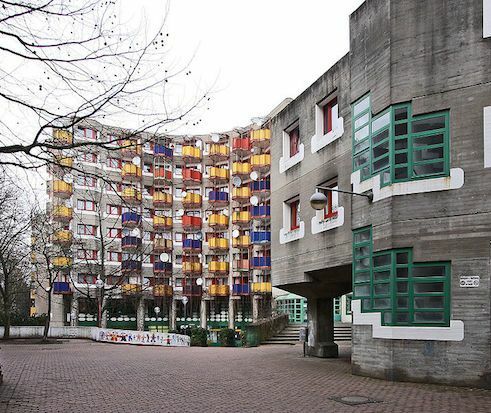 Brutalism is more of an attitude than a style, according to Oliver Elser. An attitude that made the raw building material (béton brut) into a design element. Butted edges, grain and knotholes of the wooden shuttering into which the concrete was poured are left un-plastered and therefore visible. A conspicuous number of church buildings are Brutalist. Gottfried Böhm’s Mariendom in Neviges, a small place in North Rine-Westphalia for instance, a spectacular concrete folded-plate structure reminiscent of tents clustered together that provides space for 6000 people. 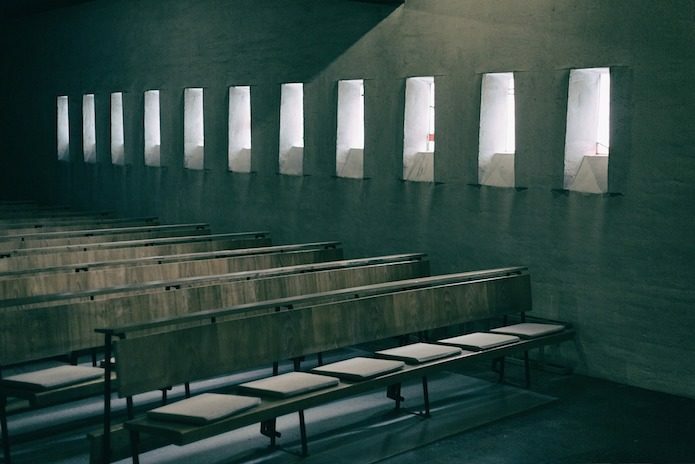 Or the block-like Church of St. Agnes by Werner Düttmann in Berlin that now serves as a gallery. The concrete dome of the Don Bosco Church by Thomas Wechs in Augsburg counts among them, just as the former priory Church of the Holy Trinity in Leipzig erected by the GDR’s Academy of Architecture and Building. Mariendom in Neviges | Gottfried Böhm | Photo: Seier+Seier In addition to houses of worship, primarily public buildings such as city halls, cultural centres or schools were erected, in large-scale format and with bold, Brutalist verve. The backdrop was a political aesthetic. Buildings for ordinary citizens were to be at least as monumental as the castles of the powerful of old. 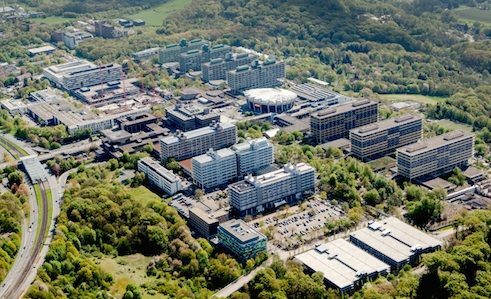 Ruhr University Bochum | Helmut Hentrich | Photo: © RUB, Marquard Tenants, too, are not consistently enthusiastic about the kind of concrete architecture erected by, for example, Gottfried Böhm from 1969 until 1974 in Cologne-Chorweiler. Too inflexible, too little consideration of the wished of the residents, runs the criticism. Residential buildings in Chorweiler | Gottfried Böhm | Photo: Elke Wetzig Closely connected with Brutalism’s comeback is a new take on its most important construction material. 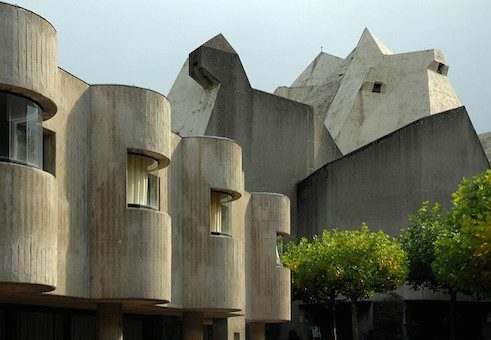 While in the 1960’s concrete still stood for utopia and new horizons, it is now mainly equated with social problems in satellite towns Oliver Elser is convinced: “Nonetheless, concrete’s grotty image is changing,“ After all, the building material itself is not responsible for urban-planning and policy blunders. But this insight is too late for many Brutalist buildings: they have been torn down in the meantime. 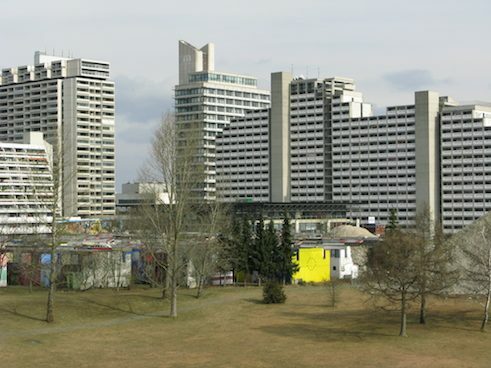 Olympic village in Munich | Heinle Wischer und Partner | Photo: Bernhard Betancourt To rescue endangered buildings and to document the robust outlandishness of this architecture, the German Museum of Architecture, the Wüstenrot Foundation and Uncube Magazine have launched the initiative #SOSBrutalism. Centrepiece is a continually growing online archive currently with about 1000 buildings around the world, classified among other things according to their degree of endangerment. Copyright: Copyright Text: Goethe-Institut, Elisabeth Schwiontek. This work is licensed under a Creative Commons Germany Attribution – NoDerivs 3.0 Germany license.